Ok, here’s the back story concerning today’s new acquisition. Back in the late 90’s, I purchased a Pelikan M200. It was my first purchase of a new “premium” pen. I had been given another premium pen, a Mont Blanc 144 as a college gradu ation gift in 1988. That pen still holds great sentimental value for me, but it was never a great writer, and has had multiple problems through the years. The Pelikan, on the other hand, was a fantastic writer and was obviously a higher quality pen from a construction point of view. 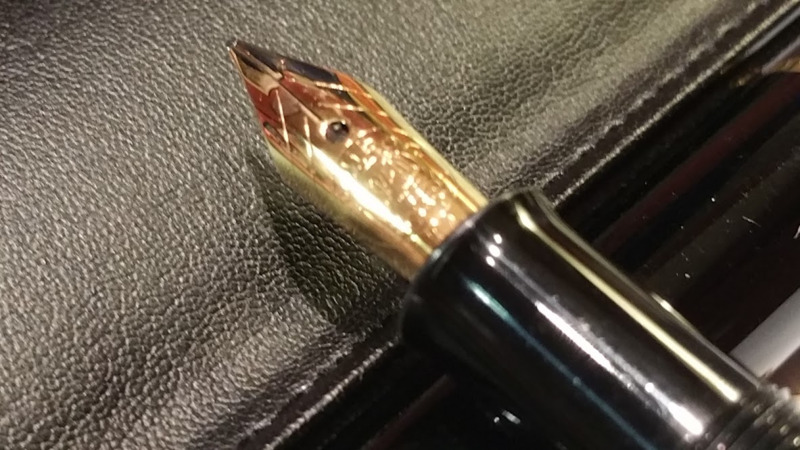 Although the Mont Blanc featured a solid gold nib, and the Pelikan’s was steel with gold plate, there was no comparison in the writing experience between the two. Let’s just say the Mont Blanc was, lacking…. Now move forward to a couple of weeks ago. 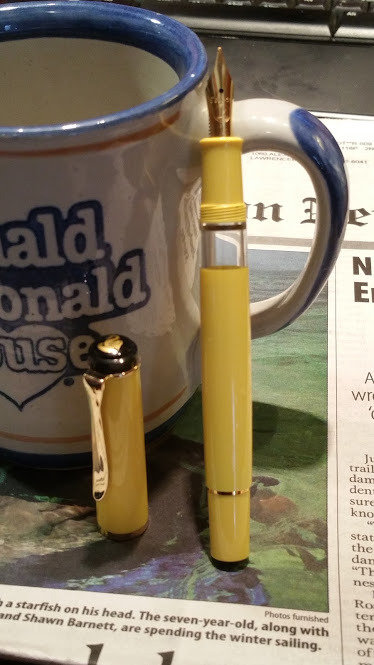 There was a give-away contest for a limited edition yellow Pelikan M200 through the Fountain Pen Network group on Facebook. I entered, and promptly forgot about it. Several days later I was notified that I had won the pen. Wah Hooo!! I received the pen, and (duh) it was fantastic! Like my original, it had a fantastically smooth, medium gold plated steel nib. Absolutely lovely. 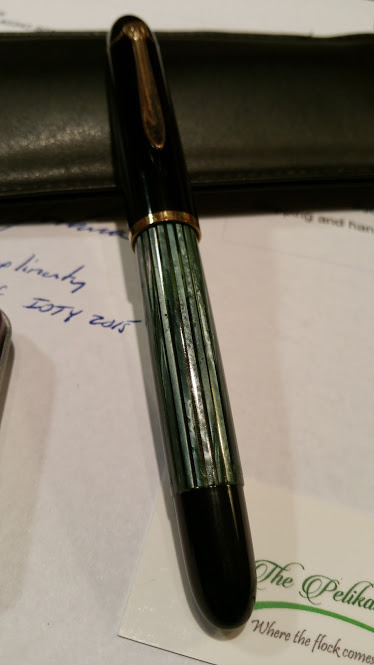 Winning this new Pelikan re-ignited a desire I’ve had for a long time, and that was to acquire a vintage bird. So off to eBay and the internet to do some research. Now cut to today. 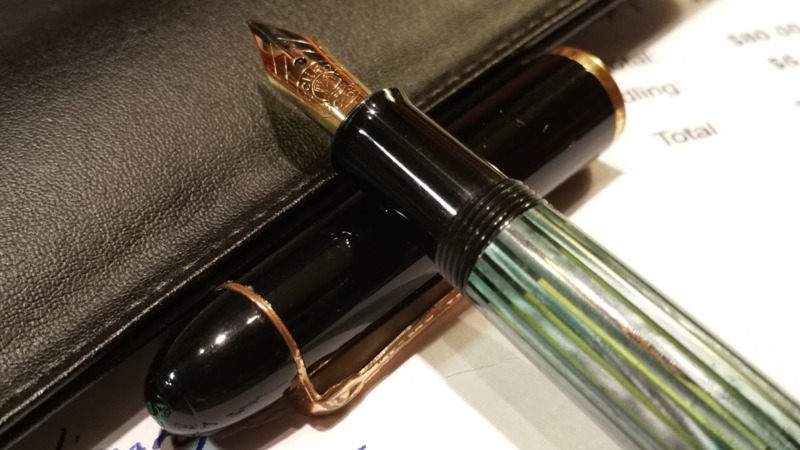 I won an auction on an early production Pelikan 140. Let me say this right now. I’ve been collecting fountain pens for over 20 years, and I’ve bought a lot of them on eBay. I’ve dealt with good sellers and bad. This was THE BEST EXPERIENCE I’VE EVER HAD with an eBay seller. He shipped quickly, packaged the pen expertly, and included several extra goodies in the package besides my pen. Nice goodies! I don’t want to go into detail about said goodies, as I don’t know whether he does this sort of thing with all the pens he sells. But let’s just say I will be buying from this guy again, sometime in the future. The seller’s eBay identification is sargetalon. He’s actually Joshua Danley with “The Pelikan Perch”, http://thepelikansperch.com . I’ll be doing a detailed review of the pen soon, But here’s the basics. It’s awesome. Yeah, that just about covers it. It’s just plain friggin awesome. As great as the M200 steel nibs are, this thing eclipses those. It’s a solid 14c gold medium nib —- with flex. Oooooooh. And the smoothness! It’s juicy and wet. Like writing on a melting ice cube smooth/wet.